A load of excitable news this week including a tuned diesel-powered 1 Series, an all-electric Porsche and a load of mouth-watering Lamborghini info! For those of you that may have missed it, Porsche showed off an interesting concept at this years Frankfurt Motor Show known as the Mission E, and the manufacturer have decided to press forward with a production release following the successful public interest it generated. The car is an electric-powered saloon that would rival Tesla, and with figures of up to 600bhp and 0-124mph in nine seconds, you'd expect they'll be able to go some way towards achieving that target. Not much is known about the car right now, but with ?1 billion worth of investment creating 1,000 new jobs, you'd imagine the manufacturer is really looking to hit the market hard when the car arrives around the year 2020. French manufacturer Renault have announced their buyout of the Lotus Formula One team, meaning a return to the sport for the first time since 2009. The company have been in the sport's limelight for the wrong reasons recently after continuous problems with the Red Bull team caused by the Renault engine. However the company decided that rather than leave the sport, they'd come back and push their engine on the grid. It's unlikely we'll see them win any time soon, however with their chairman and CEO Charles Ghosn saying "Our ambition is to win - even if it'll take some time. ", you can imagine they won't be far off from producing a Championship winning car like they did with Fernando Alonso in 2005 and 2006. With images emerging last week of a potential 675LT Spider in testing, it seems that the sports car specialist has decided to break their silence and fully announce the drop-top variant of it's track-focused beast. The Spider will be limited to just 500 units worldwide which we imagine will sell pretty damn quickly, even if they start at £285,450. It launches in summer 2016 with the same 666bhp 3.8-litre twin-turbo V8 found in the coupe version, but a slight overall performance decrease due to it's extra 40kg in weight. Although only computer renders like that above have been revealed for now, we can really envisage the final production car looking absolutely fantastic in the flesh! Lamborghini news - a turbo V8-powered car and even more! We usually only choose the best news from each week to bring to you all, however there's just too much Lamborghini news to choose from so we'll simply cover it all! The first bit of news is that the company's new SUV known as the Urus is going to be powered by a 4.0-litre twin turbo V8! It's a first for the Italian supercar manufacturer, but not surprising considering it's the way most are going now. What it means for the future of the brand who knows? We imagine they'll stick with the V10 and V12's for now... however it does make you wonder what might be, right? In other news there seems to have been some spy spots of a Huracan sporting a huge rear wing which have us all wondering 'is a Superleggera version coming?'. The SV or Superleggera versions often come a few years into a models lifecycle, but could these images mean an earlier-than-normal release? The company's CEO said "Yes, sooner or later we will have this. But not next year" which maybe suggests this spotted car isn't it... but it's exciting nonetheless! Lastly and most importantly, the company celebrate its 100 year anniversary in 2016 and is set to launch a special limited-edition supercar to mark the occasion. The car dubbed the Centenario will be limited to 20 examples and likely to be powered by an upgraded version of the 6.5-litre V12 found in their Aventador Superveloce. That means you can expect power figures of 760-800bhp - wow! So, three excitable Lamborghini news pieces to salivate your mouths with... we're looking forward to seeing what happens with regards to them all! 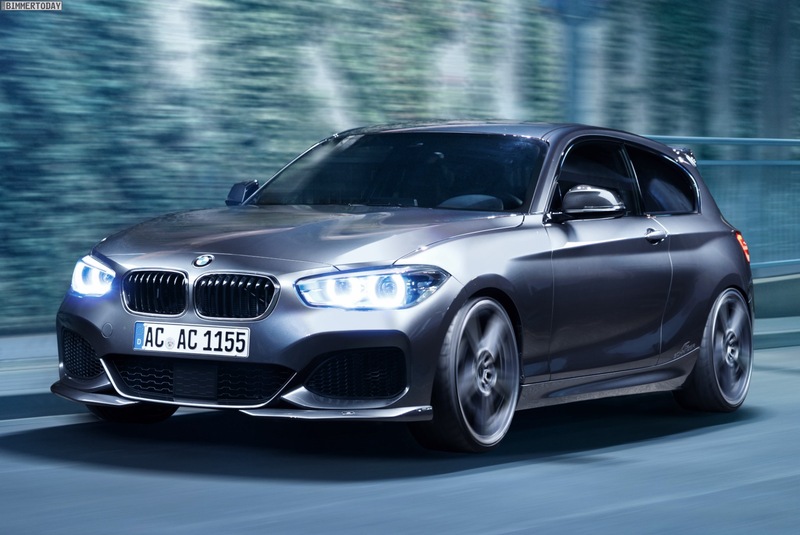 German tuning company AC Schnitzer have unveiled a very special 1 Series called the ACS1 5.0d which is even faster than a M135i. They've somehow managed to squeeze the same 3.0-litre tri-turbo diesel engine from the X5 M50d into the little 1 Series hatchback, meaning a 395bhp animal capable of 0-62mph in 4.5 seconds! The car has other upgrades too, such as a front spoiler, chrome grill, roof wing, fully adjustable suspension, sports exhaust and chunky alloy wheels. All of these changes make the car the best looking 1 Series we've ever seen - and a really fast one too!